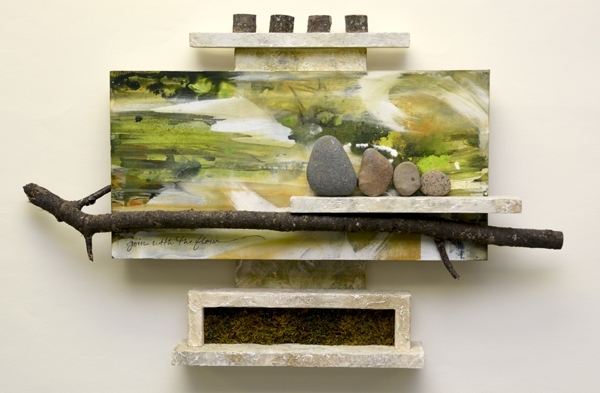 Cheryl Holz is a midwestern artist whose mixed media artwork celebrates nature’s strength, beauty and diversity. Like sediment accumulates in a riverbed, she builds up layers of textured surfaces, organic painting processes, and relevant text on wooden panels. Portions are excavated to reveal botanical or geological specimens and natural patterns. Cheryl has received local and national recognition for her work, and shows in galleries, museums and juried shows throughout the country. Her work is included in many corporate, private, and health care collections - and is available here! Want to be the first to hear about upcoming openings, events and what's happening in the studio? Sign up for my emailing list below!